Are companies prepared for the new energy future? 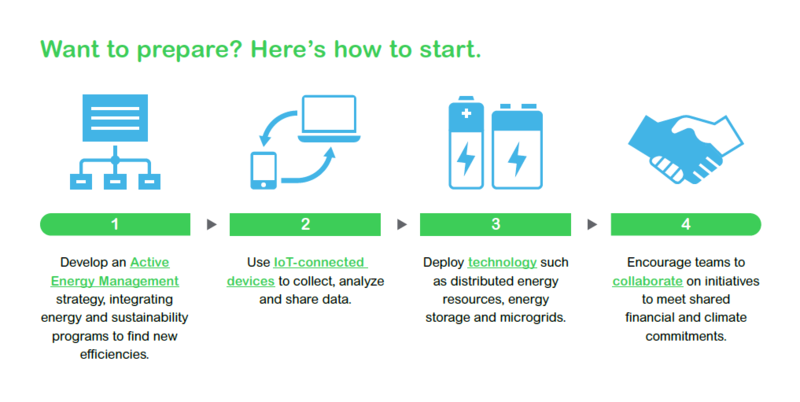 Schneider Electric and GreenBiz Research surveyed energy and sustainability professionals from almost 240 large companies to understand how organizations are preparing for a decarbonized, decentralized and digitized energy future. Here are highlights of the research, for more details download the full report. The energy landscape is on the brink of disruption, becoming decentralized, decarbonized and digitized. Plus, corporate environmental commitments are on the rise: More than 60 percent of the Fortune 100 has set one or more clean energy targets. Major change can bring major risk—or new ways to save money, meet goals and build resiliency. 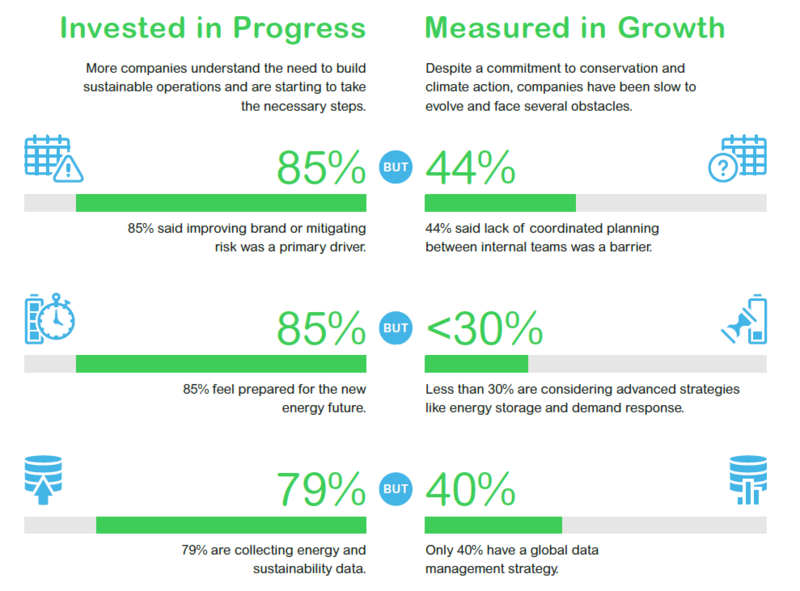 Our survey found that though companies are setting goals and collecting data, progress towards goals is hampered by a lack of coordination, low rates of adoption of advanced strategies such as energy storage or demand response and site level data vs. global energy and sustainability data. What can companies do to prepare? To thrive in the new energy landscape, companies must design their energy and sustainability strategy to be a competitive differentiator. Advances in energy markets and technologies have given companies more control over how they use energy, how much that energy costs and how that energy is sourced. Active Energy Management means holistically looking at energy and sustainability programs to find new efficiencies and savings opportunities and to plot continuous growth. Examples include demand response programs based on real-time price signals, combining renewable energy strategies and efficiency programs to reach CO₂-reduction goals or using utility invoices to comply with energy management and sustainability compliance programs. Several promising trends emerged, which confirm widespread support for renewable energy and highlight changes in how companies view and prioritize energy- and climate-focused programs. More than 50 percent of companies represented have initiated renewable energy projects or plan to do so within the next two years, with healthcare (64 percent) and consumer goods (58 percent) leading the way. Plus, the C-suite and corporate functions have a high degree of involvement in these and other sustainability-focused programs. 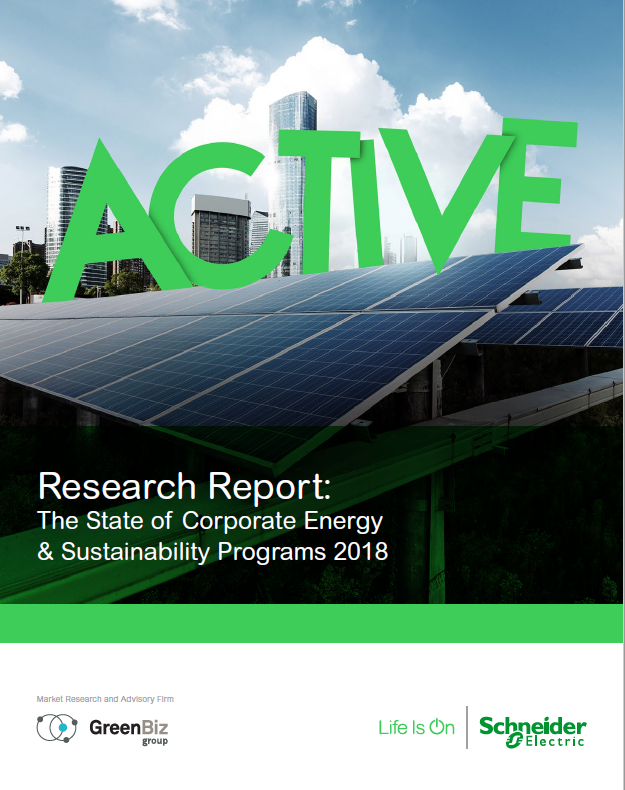 Seventy-four percent said C-suite members review or approve renewables and sustainability initiatives, for instance, indicating this work is seen as a strategic priority. Read the full research report .